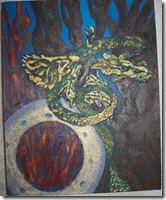 Renee has a new painting up for auction on eBay called "Friend in Need Dragon." She is using the auction to help fund a documentary she is shooting about Mary Rocamora, her Awareness Training teacher and mentor. She will also be starting a campaign on the crowd-funding site, Indiegogo, to fund the film. There is a message from Renee posted in her eBay auction posting with this same information. The auction ends on January 13 at 5:17PM Pacific Standard Time. Hello, it has been such a long time since I have been painting. This one is inspired by the last episode of Xena. 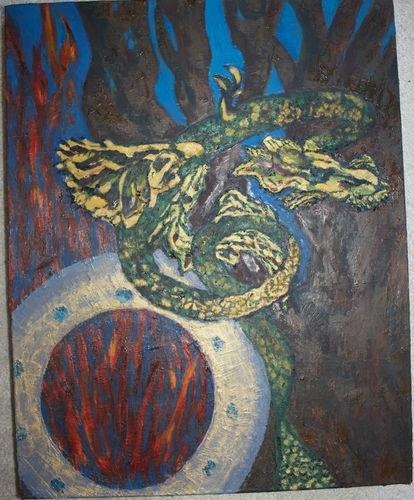 I am contributing the proceeds from this painting to a documentary I am filming about my teacher and mentor, Mary Rocamora. It will be a resource for the filming in addition to a campaign on Indiegogo coming shortly.